NTモトヤ正楷書3 font family series mainly provide Regular and other font styles. NTモトヤ正楷書5 font family series mainly provide Regular and other font styles. NTモトヤ正楷書3等幅 font family series mainly provide Regular and other font styles. NTモトヤ正楷書5等幅 font family series mainly provide Regular and other font styles. 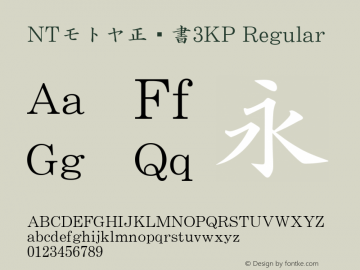 NTモトヤ正楷書3KP font family series mainly provide Regular and other font styles. NTモトヤ正楷書5KP font family series mainly provide Regular and other font styles. NTモトヤ正楷書 Std W5 font family series mainly provide Bold and other font styles. NTモトヤ正楷書 Std W3 font family series mainly provide Regular and other font styles. Tモトヤ正楷書3 font family series mainly provide Regular and other font styles. Tモトヤ正楷書3等幅 font family series mainly provide Regular and other font styles.